The Executive Director of the Philippine Association of Colleges and Universities of Industrial Technology (PACUIT), Inc., Dr. Renato V. Alba visited the Colombo Plan Staff College (CPSC) on June 8, 2016. He was cordially welcomed by Prof. Dr. G. Kulanthaivel, CPSC Acting Director General, Mr. Vergel Dela Paz, Human Resource Management Officer and Ms. Adrienne Abril, Executive Secretary at the Office of the Director General. 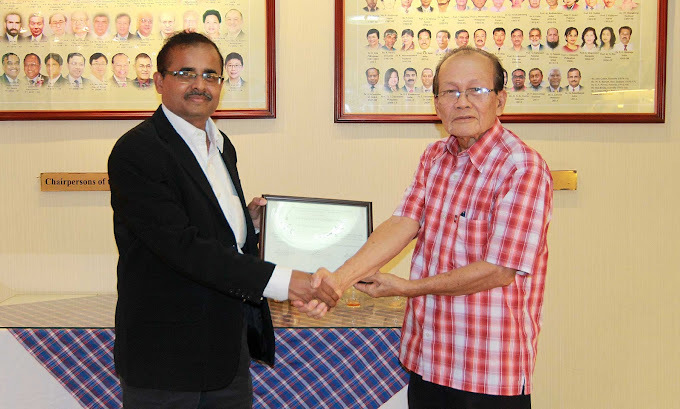 On behalf of PACUIT, Dr. Alba presented a Certificate of Appreciation to Dr. Kulanthaivel in recognition of CPSC’s efforts during the 14th PACUIT National Conference held in Tagaytay City, Philippines last April 27-29, 2016. He also expressed his sincere appreciation of CPSC’s active role in further improving TVET provision in the region and reminisced days of his associations with CPSC mentioning fruitful undertakings locally and overseas with its past Director Generals. Dr. Alba revealed his optimism on holding the annual PACUIT Conference sometime in April next year. In addition, both leaders discussed future opportunities for further cooperation, particularly on probable partnerships in national and international conferences and in-country training program. CPSC further affirmed its support to PACUIT in its mutual advocacies for TVET. CPSC Acting DG, Prof. Dr. G. Kulanthaivel acknowledging the token of appreciation from the PACUIT Executive Director, Dr. Renato Alba. Ms. Adrienne Abril (Executive Secretary), Mr. Vergel Dela Paz (Human Resource Management Officer), Prof. Dr. G. Kulanthaivel (Acting Director General), Dr. Renato Alba (PACUIT Executive Director) and Rebecca Gegantoni (CPSC Professional Intern from the Philippines). Dr. Alba discussing PACUIT’s future plans to the rest of the attendees.